It’s officially been half a year of falling more in love with this sweet girl every single day. 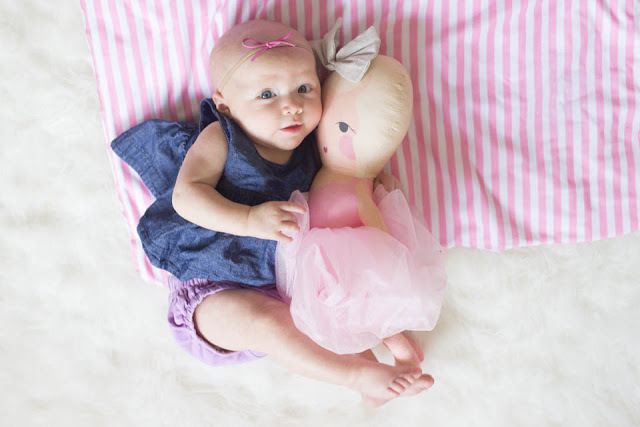 Happy half-birthday, Avalon Elle! We are so thankful that you are ours. 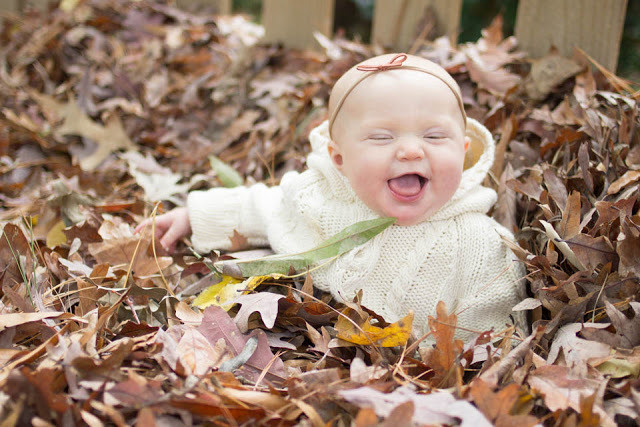 Our littlest love continues her official status as just the happiest babe ever. She is so smiley, her entire body exudes pure joy 95% of the time and I get stopped almost daily with comments on how infectious her spirit is. 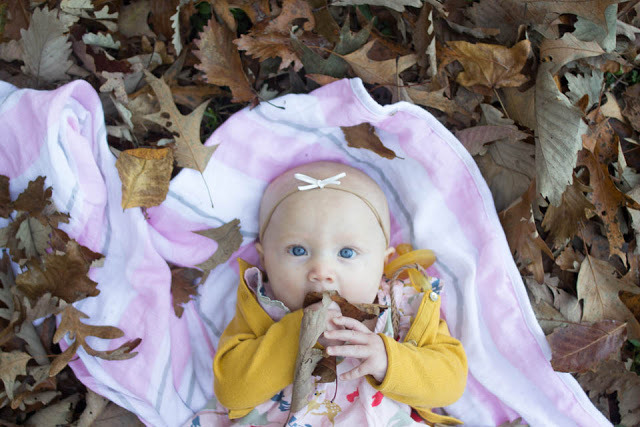 She is just delicious, her eyes are the most beautiful shade of blue and even though it doesn’t show in pictures, she does have hair that seems to be coming in blonde. She’s still our tiny lady, wearing a combination of 0-3 month & 3-6 month clothes, and doesn’t seem to be growing out out of them anytime soon. Also, like every other previous month so far, she looks so much like Waverly did at this age. It’s seriously crazy to look at pictures, I remember wondering if they would look alike during my pregnancy & I really love that it turns out, they really (really!) do! 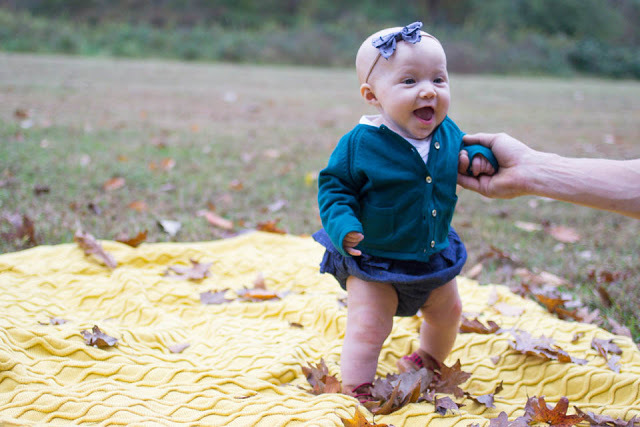 It’s been a big month for milestones, I feel like so much has happened with our sweet girl lately. One of my favorites, she started sitting up on her own a couple of weeks ago & it’s so, so adorable. She is just so little that it looks like she shouldn’t be able to do that quite yet, which makes it even cuter! She is as strong as ever, able to roll from both sides and stands pretty well with us just holding one hand. And she is into everything. Everything! You can’t hold anything when you are holding her, or even put anything down near her reach if you don’t want her to touch it. Though she obviously has tons of toys, her current favorite items include clothing tags, bags, or any kind of paper. 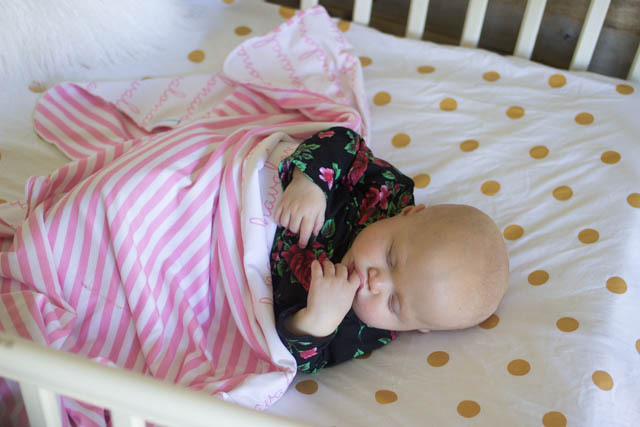 Other big news, she is sleeping in her crib! Both for naps & at night!!! The transition didn’t end up being near as much of a challenge that I thought it would be, we started with the sleep sack and still use it some, but don’t even need it all of the time anymore. Turns out she is a belly sleeper, even though I always lay her down on her back she usually rolls over within minutes, sometimes even seconds & once she does, she is out! Waverly never did this, so it was very scary at first, but she definitely seems to sleep better that way so it’s working well for everyone. She has been sleeping through the night for the last week or so & pretty much nails her first nap every single day. The afternoon nap is definitely hit or miss, but we will take what we can get! 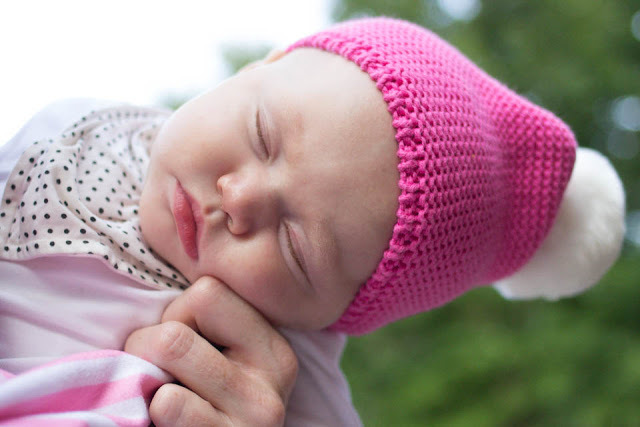 Avalon is still a rock star at breastfeeding, loves it & would do it all day if she could. Yet when it comes to any other food, she is less than impressed. We have tried everything, pretty much every fruit and veggie we can think of, plus rice cereal, oatmeal and even a little bit of baby-led weaning. None of it seems to interest her right now, this is new territory for us so I would love tips if you have them! I am sure she will like something at some point (she has to, right?! ), but for now, we are rolling with it! I will take all the breastfeeding snuggles, all the time. I can't believe it's already been a half a year!! And she just gets more gorgeous with each passing month! Gosh, she really is just the sweetest most delicious thing ever! Happy Half birthday little nugget! Oh my gosh, the cutest! And sleeping in her crib?! Way to go!! Time is flying!! She is just precious. I wouldn't worry about food. They seem to go through phases. Maybe give it a little break and try again in a few weeks and see if she likes anything. Good luck! Happy half birthday to sweet Avalon! She's just so darn precious! It makes me sort of hope we're having a girl! She is so precious! I'm so glad the crib ttansitiont went well! This makes me SO EXCITED to my second peanut to get here!!!! However, how on earth is she already 6 months? Weren't you JUST pregnant? Happy half birthday sweet Avalon!! 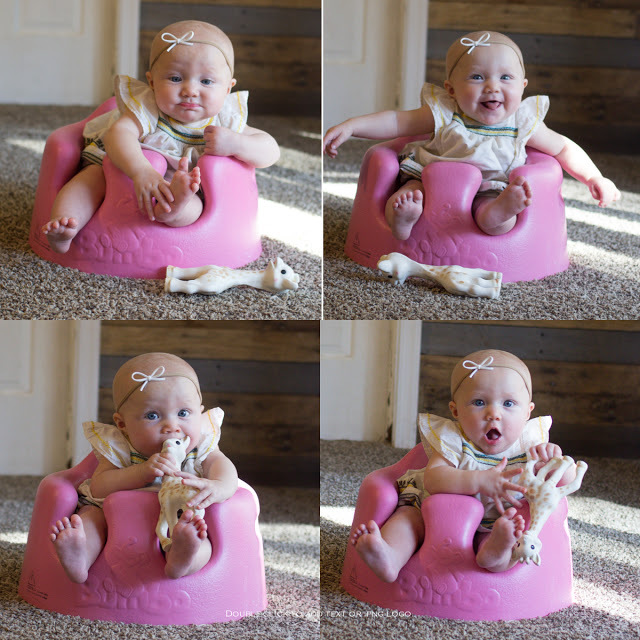 Precious pictures of your darling baby girl. I just love how tiny she is! And that smile is infectious! 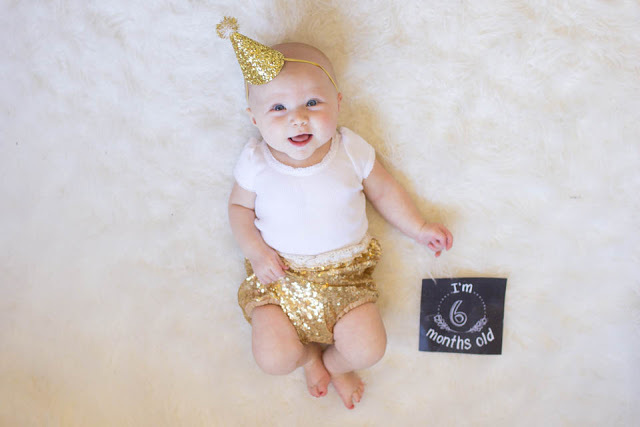 Happy 6 month, Avalon! Wow time flies so fast. Congrats on being in a crib! I am a stomach sleeper too and I can't sleep any other way. Also, I love her little black and white striped number. Where is that from? Gahhhhhhh she is just perfection! The sweetest, tiniest, cutest little peanut! Happy 6 Months to Avalon! Such fun milestones! She is just so sweet. I'm sure before too long she'll be eating some solids. We only tried once or twice just last week, and Oliver was not a fan – at. all. So, I decided to wait until we have a kind of routine again after the holidays are over and try again then. We shall see!